Ken started his ambulance service career at Superior Air-Ground Ambulance Service of Michigan in July 2009, working as an EMT and qualifying as a Paramedic in 2013. After working in the field for two years, Ken gained additional experience serving as a dispatcher and inventory controller, working his way up to operations supervisor and eventually station manager. 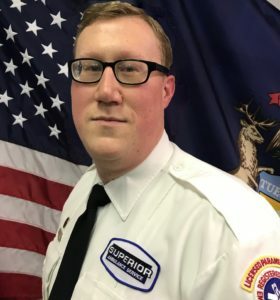 In 2015, he was promoted to operations manager for the entire Michigan region of Superior—a vital role, where he very capably leads six station managers through every aspect of daily operations for EMS and Non-Emergent Medical Transportation. Superior of Michigan is a large ambulance company, and his position requires dedicated, consistent leadership. Ken continuously proves himself instrumental at managing and planning the tactical and strategic initiatives that directly affect with the mission and vision of Superior. Ken is well known by his peers for his friendly, composed demeanor. He leads by example through his positivity and exceedingly strong work ethic. His key strengths are his competitive, analytical, and strategic thinking and planning, but Ken is also empathetic and thoughtfully balances his personal and professional attributes to be an effective leader and respected colleague. Ken was a key contributor to Superior of Michigan’s achieving CAAS accreditation in November 2017. He doesn’t rest on this achievement, though, and he continues to promote the understanding that he manages a company that must constantly live up to the challenge of exceeding industry standards and find ways to translate this into everyday actions. The ambulance industry needs managers with this attitude, and that is why Ken is recognized as a highly valued member of the Superior team. He is vital to our organization’s growth and elite status in the ambulance industry. In his personal time, Ken enjoys spending quality time with his family, truly focusing on the joys of life with his wife, Brittany, and his 2-year-old son, Alex (who looks just like him in miniature form). Ken and his wife are expecting their second child in September.